Senior Lindsey Dunn has participated with the Future Farmers of America her entire time in high school. Lindsey has a passionate desire to care for animals of all types, especially ones that moo! Lindsey has been competing in livestock shows for several years. 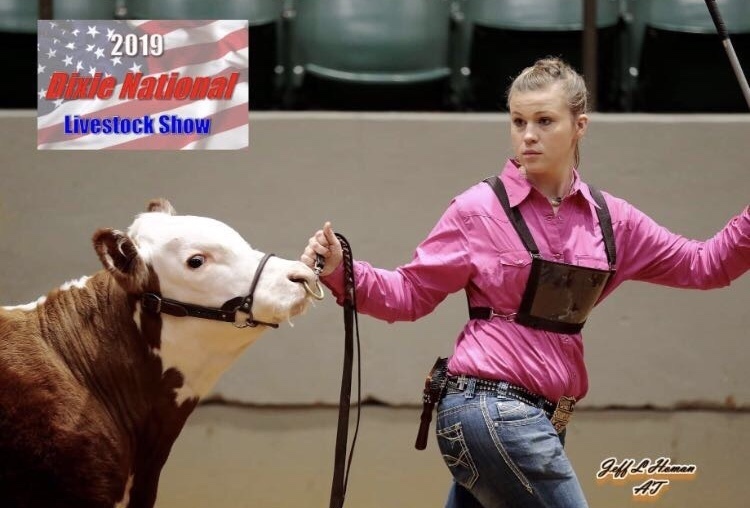 Recently, she traveled to Jackson, Mississippi to compete in the Dixie National Livestock Show. Competition was intense, but it didn't bother Lindsey. She went down there with high hopes for winning and came back with evidence of her hard work. Lindsey placed 1st in Early Summer Hereford Heifer Calf and placed 6th in Early Senior Hereford Heifer Calf. Her championship performance was one that caught the attention of several people. Lindsey has been awarded a scholarship totaling $1500 from the Dixie National Sale of Champions. She will headed back to the state's capital on February 7 to receive her award.